California’s famed LaCosta was one of our favorite stops during our coast to coast golf tour. Our latest, extended travels to golf destinations are over now, and they were unprecedented. We were basically on the road for six months – from Oct. 1 to April 10 – and made visits to destinations in Nebraska, Montana, Idaho, Washington, Oregon, California. Mississippi, Louisiana, South Carolina, Florida, Georgia, North Carolina, Virginia and Indiana. Find more photos from the PGA Championship in our Flickr album here. Jason Day seized the 97th PGA Championship today with a final-round 67 to edge Jordan Spieth by three strokes. Day’s closing 67 included seven birdies, nine pars and two bogeys. Day was playing in his sixth PGA Championship. Before today, his best finish in this Championship was T-8 in 2013 at Oak Hill. The win was the fifth of his career; two have come in three weeks. He won the RBC Canadian Open on July 26. ERIN, Wis. – Erin Hills has gotten nothing but better since its opening in 2006. 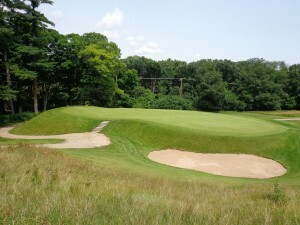 That was clearly evident when the facility on the outskirts of Milwaukee conducted what has become an annual outing leading into its ultimate showing – as the site of the 2017 U.S. Open. Jim Reinhart, general chairman for the big event, was presented with a good opportunity to compare Erin Hills with a similar facility. Chambers Bay, in Washington, hosted a U.S. Open that wasn’t without controversy a week before Erin opened its doors to about 50 media members from around the Midwest. Reinhart tried hard to steer clearly of controversy in making comparisons. When you visit the SentryWorld course in Stevens Point, WI., there’s always the temptation to get overwhelmed by its world-renowned Flower Hole. I’ve seen lots of beautiful golf holes, but No. 16 at SentryWorld remains my choice as the most beautiful. The course opened in 1982 and was recently renovated by Robert Trent Jones Jr. in collaboration with Bruce Charlton and Jay Blasi. GREEN LAKE, Wis. – Shame on me. This golf writer of nearly 50 years didn’t know nearly enough about the work of William Langford until playing in last week’s Langford Shield outing at The Links of Lawsonia. The course got its name from the legendary newspaperman Victor Lawson. He was the publisher of the Chicago Daily News prior to his death in 1925, and The Links of Lawsonia was built on a three-hour drive from Chicago near the small college town of Ripon. There’s reportedly a boxcar under the No. 7 green at The Links of Lawsonia. The elevation it created makes for a most interesting par-3.